FREDONIA, N.Y. - Dec. 12, 2018 - PRLog -- For the past five years author Steve Ubaney has been writing one of the most interesting books series ever published. The series debunks the historical record of celebrity deaths revealing that some of the most famous deaths were actually murders. Volume 1 in that series was published in 2013. The book was entitled Who Murdered Elvis?. The shocking book revisited Elvis Presley's final days in a way that no one else ever has as it probed every part of Presley's mysterious death, FBI involvement, and the sinister forces at work during the final days of his life. That book took five years to research and write. This year, 2018, five years after the first volume on Presley was published, he has uncovered more. His latest release Who Murdered Elvis? 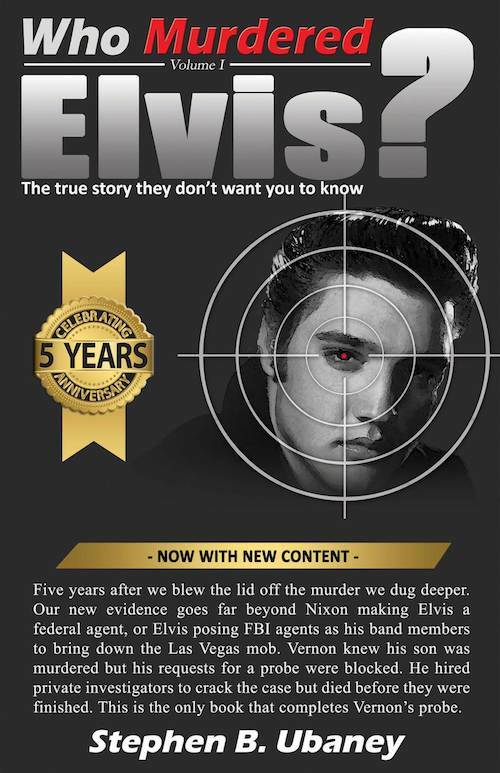 5th Anniversary Edition goes beyond the knowledge of Elvis Presley being made a federal agent by President Nixon. It goes beyond the knowledge of Elvis' father, doctor, chief of security and his girlfriend all suspecting foul play. It goes beyond Elvis posing FBI agents as band members when he played in Las Vegas. This book blows the lid off the entire murder. After a full decade of fresh research into Presley's murder the truth will finally be revealed. His books series and related research has made him a frequent guest on television, radio and podcast programs worldwide. Most recently he has appeared on the nationally syndicated radio show "Coast to Coast". Mr. Ubaney loves to discuss his research and his work. He is available for interviews upon request. Sir Winston Churchill, Christopher Lloyd, Janis Joplin, Gene Roddenberry, George H. W. Bush, 41st U.S. President, Marilyn Monroe, George W. Bush, 43rd U.S. President, Roger Sherman, Signer of the Declaration of Independence, Herbert Hoover, 31st U.S. President, John Lithgow, Robert Treat Paine, Signer of the Declaration of Independence, Harriet Beecher Stowe, Tennessee Williams, William Howard Taft, 27th U.S. President, Henry Fonda, Norman Rockwell, John Steinbeck, and QB Aaron Rodgers.